In Cuenca in the 15th century, the neighborhood of “Las Ollerias” was born with strength, where the potteries of the city are located. 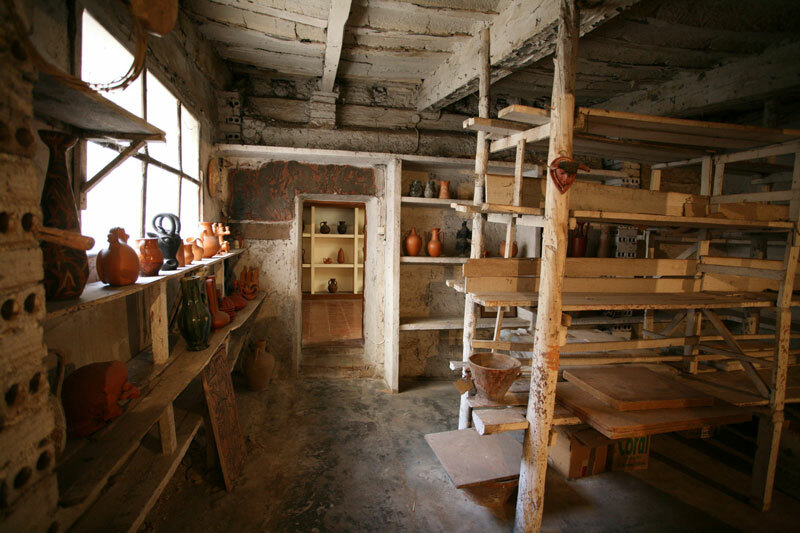 Regulated in the “Fuero de Cuenca” by King Alfonso VIII the office of the “ollero”, those artisans of clay with kiln and workshop, who made the “pots” by hand using the lathe and then cooked in a wood oven. 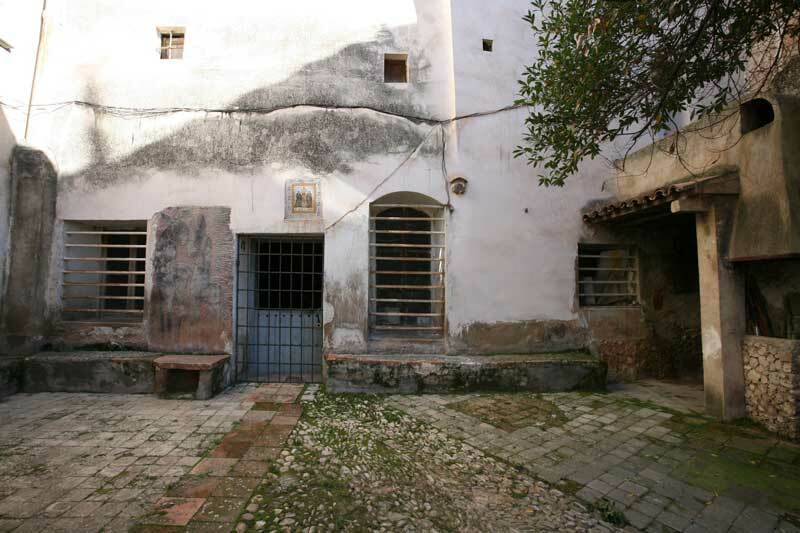 They coexisted in the suburb of S. Antón with the people of the rural world. 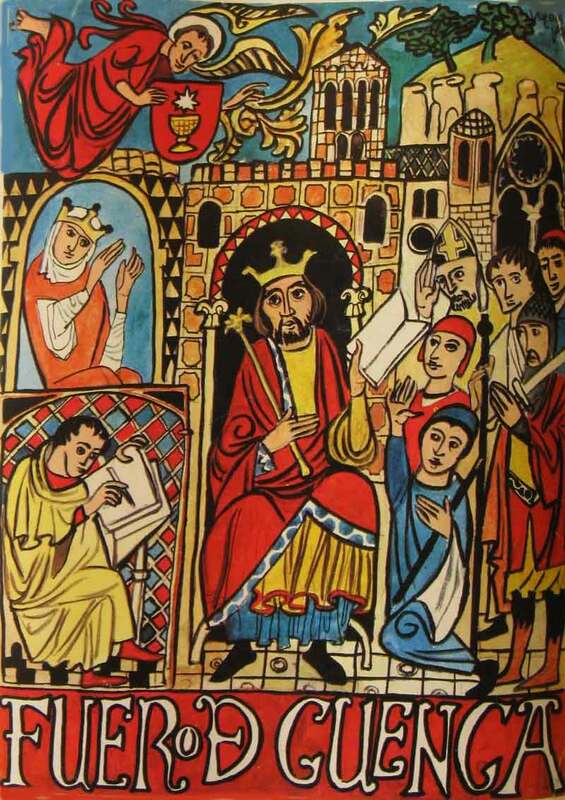 “… In Cuenca there were more than 42 factories of pottery, of glaze and ordinary clay and three of finer china …”. Of all these potteries is only today, not only in Cuenca but probably in all of Spain, Pedro Mercedes, located in what is now known as Avda de Los Alfares, next to the Júcar River where water was supplied and next to the hill of the “La Majestad” that protected them from the winds and supplied wood for their kilns. In excavations carried out in the aforementioned workshop in the summer of 2014, archaeological remains have been found, which make it possible to date its origin from the late 15th century, having also devoted in all these years, solely and exclusively to the activity of pottery. 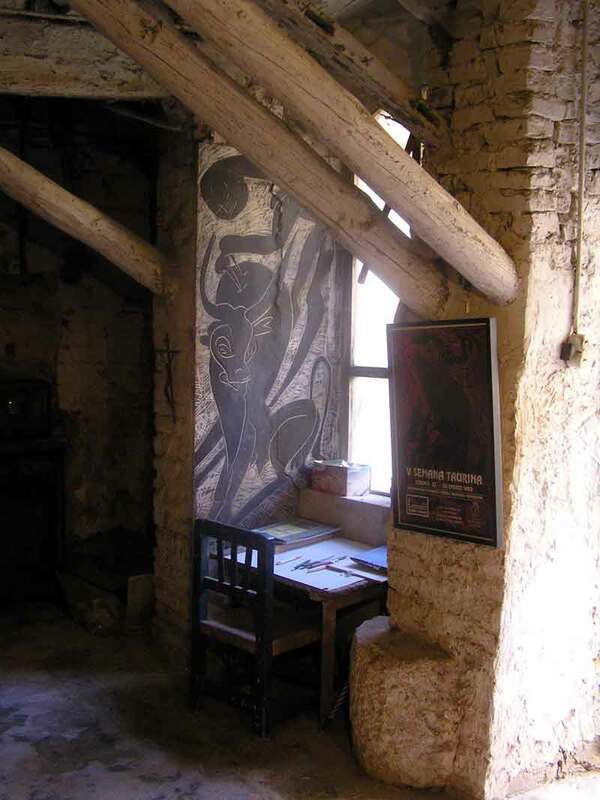 The workshop of Pedro Mercedes has a lot of sanctuary, place of initiation, where he has left reflected his desires and the evolution of his creative process. From the central area, where the pieces were put to dry in summer, in ancient polychrome pottery, the images of Santa Justa and Rufina, patrons of the pottery, crown the entrance door, and as guarding this, scraped in plaster by Pedro Mercedes, the donkeys that were used to haul the land, the first task of every potter. You enter the work area, which consists of a large room-workshop in which there are the same two traditional lathes as always, in which potters sitting on a bench rotated the “wheel” by a movement of the foot, what it transmits to the upper part where the “pella” of clay is placed, the rotary movement that the potter needs to perform his work with his hands always wet. After the turnstiles, another mural as an altar with an Iberian rider armed with bow and surrounded by his dog that hunts a boar. In front of them the old table and chair, with the instruments with which Pedro Mercedes has created so much, lit from the window by the strength of an ancestral warrior who hunts the original animal, the prehistoric bull. “… IN THIS ALFAR I THINK THAT THERE IS A MAGICAL CREATURE AND THAT CREATURE HAS A CERTAIN CONVERSATION WITH ME, ALTHOUGH IT IS IN THE IMAGINATION, I NEVER FEEL ALONE, ALWAYS THERE IS SOMETHING OR ‘SOMEBODY’ WHO IS WITH ME …”. 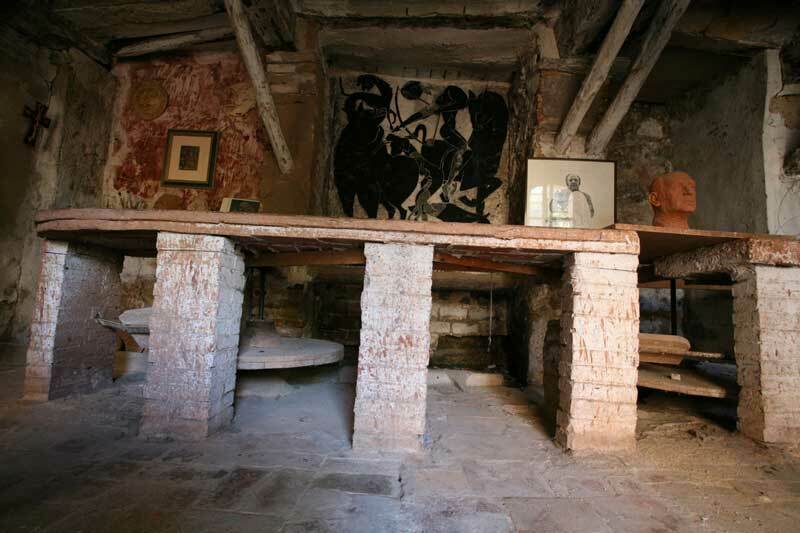 Inside this room is the “sobadera” where each potter kneaded or “sobaba” carefully, by force of hands and arms, the piece of clay or “pella” to give it the necessary hardness and that it had previously taken from the warehouse. To the area of ​​bathed and dried the pieces were taken from the winch, waiting for them to be able to be decorated, taking care that they did not suffer drafts. 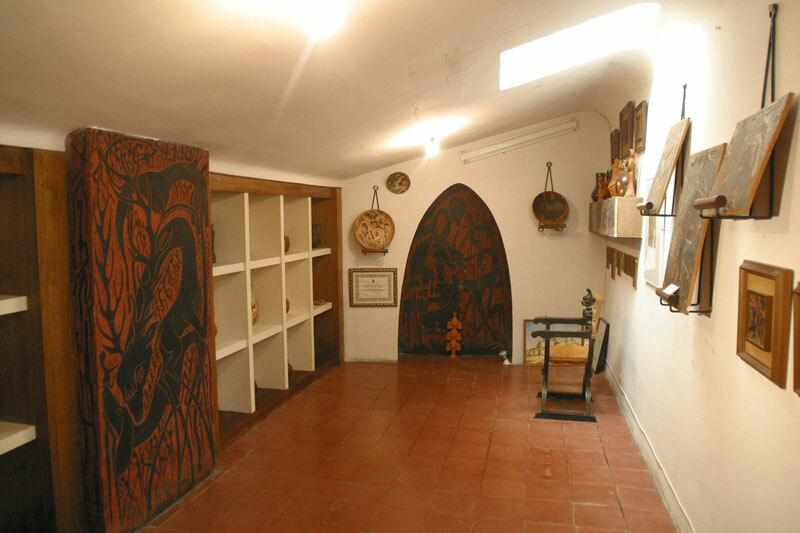 There is another room in which the pieces already decorated were placed waiting to be cooked. The secret chamber or “cella” of the workshop is accessed by crossing a lintel under another relief in which several mothers play amorous with their children. This exhibition space is presided over by another mural, made on the front wall in the shape of an arch, where a shepherd cares lovingly of his flock of sheep, who let themselves be caressed. On the side wall, Pedro Mercedes has captured the theme of concord with a new mural where a deer seems to bend over itself to caress a dog. 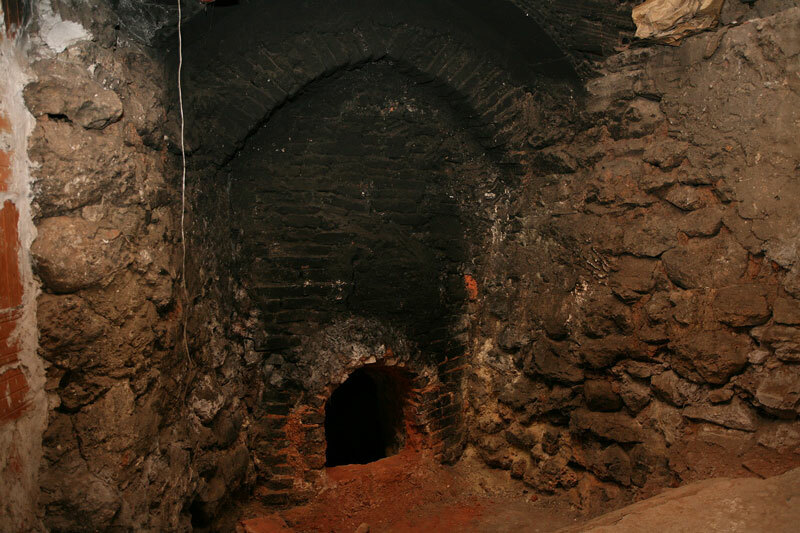 The “Moorish” kiln is also more than 400 years old and, barring its narrowing of walls, few modifications have been made throughout its history. 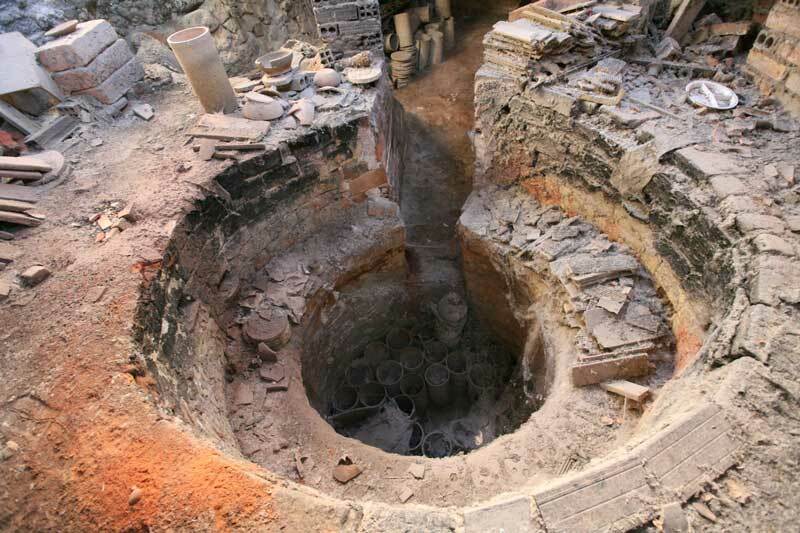 Carefully dug in the ideal place, to avoid any draft, it is a large adobe pit 2.5 meters in diameter by 2 meters high. The conduction to the kiln of the raw pieces is a rite, each one must be treated with great love and placed inside a container or box, so that it is not ‘stuck’ with the one next to it. From the boiler, the fire goes up to the kiln through some embrasures made in the base. The pieces were placed on the top forming floors and ordered by size, always close together to take advantage of the space, but without touching. It is closed with pieces of broken pieces or “caps”. The cooking process lasted 2 nights with the middle day. The “temple”, whose mission was to dry the pots, began the afternoon of the chosen day, with several small bonfires of low and moderate flame, which must be grown slowly but steadily. “… THAT NOISE OF THE CLAY COOKING, YOU HAVE TO FEEL IT, LISTEN TO IT, IT IS WHEN THE CLAY CRIES FOR THE POTTER, THE SOIL CRIES FOR YOU …”. At the second dusk, the “caldas” work begins, every half hour the temperature must be raised little by little, always trying to get intense and regular flames, until the next morning the smoke has turned almost white. “… FIRING IN AN KILN LIKE MINE IS A TRUE HAPPINESS, IT IS A CHARM TO SEE THE FLAME, THE BOILER GOES THROUGH VARIOUS COLORS, DARK, LEMON, MORE YELLOW, WHITE, THE FLAMES THAT COME OUT OF THE MOUTH LIKE IT WERE A DRAGON WHO WANTS TO CATCH THE ONE WHO HAS CAUTIVATED THE FIRE INTO THE KILN, AFTER WHEN THE CALDAS ARE DECAYED, BELOW, IT IS AN INCOMPARABLE BEAUTY, AS IF A TREASURE WOULD BE TREATED … “. And then we still have to wait three days for the kiln to cool down and be able to remove the pieces, with the uncertainty of any craft process, in short to wait for the moment of truth. In this way the four basic elements have been conjugated: soil, water, air and fire, to give the art of Pedro Mercedes the final heavenly breath.